NEW ... We know from your comments that our website is increasingly valued for research and by everyone who wants to know the Truth about QUEEN ELIZABETH I, LADY TROY, and BLANCHE and about the times in which they lived. Our research is accurate and referenced. Ruth OUT & ABOUT past & present – Here you can discover fascinating facts about people in Herefordshire and the surrounding areas and you can often visit the places mentioned. More stories are regularly added. PLACES TO VISIT – a collection of related and interesting places to visit in the Golden Valley and the surrounding area. Thank you for visiting us. We are always glad to hear from you . Best Wishes, Ruth E. Richardson. 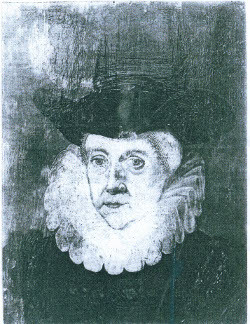 Blanche Parry accompanied her aunt, Lady Troy, to the Tudor Royal Court. King Henry VIII appointed Lady Troy as Guardian / Lady Mistress to his children, Princess Elizabeth and Prince Edward; she supervised Princess Mary when she lived with them. Blanche, close to Queen Elizabeth I for 56 years, was pre-eminent at the centre of the Elizabethan Court. Lord Burghley was her friend and cousin. the priceless Bacton Altar Cloth, the only provenanced section from Queen Elizabeth's 1900 dresses and the only surviving quality cloth of the period with direct embroidery. Copies available from: logastonpress and through amazon.co.uk. 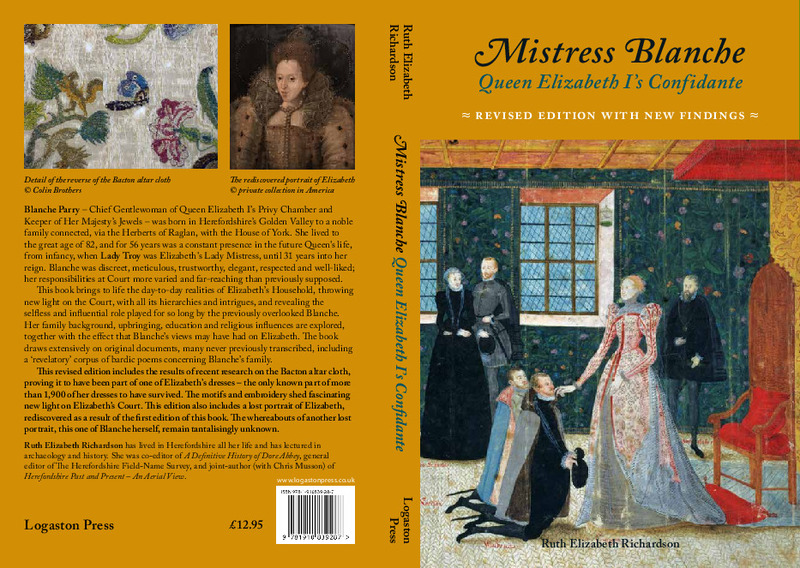 Beautiful, superb quality, pictures, with text, based on this book are available in ‘Blanche Parry & Queen Elizabeth I’. The Epitaph was composed by Blanche herself for her monument in Bacton Church, Herefordshire. The Bacton Monument is now securely dated to before November 1578 and so is the earliest known depiction of Queen Elizabeth I as an icon, as Gloriana. This is, therefore, nationally important. Compare with Blanche's St. Margaret's Epitaph in St. Margaret's Church, Westminster (see Biography page 136). Harri Ddu ap Gruffudd's cupboard panel. If you have additional research that is accurate, referenced & relevant it may be considered for inclusion under your name - please contact the webmaster. Thank you.